Friends of ours just sent over the picture up top, which as you can see, is the new in-store display for the DROID RAZR. Talk about making a statement, right? 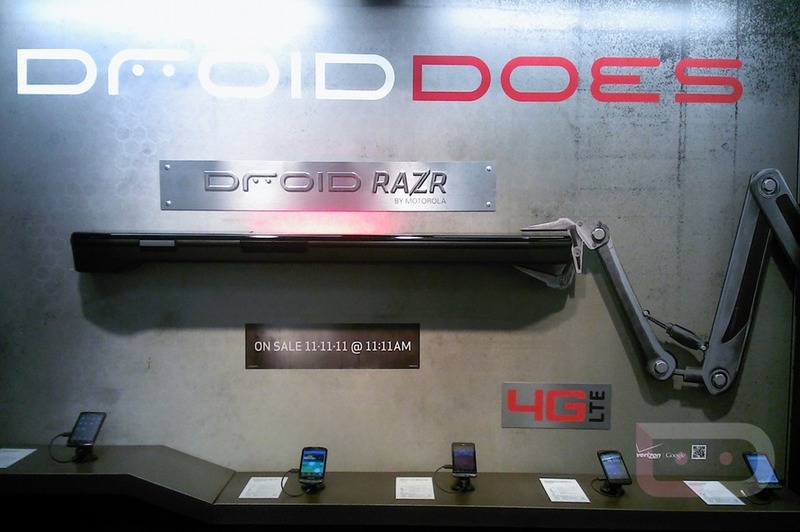 Ultra-thin phone, held by a robotic arm, a 4G LTE logo present, and that semi-silly 11/11/11 at 11:11AM launch time have this looking like one of the biggest DROID launches yet. It’s going to be a massive month of November now that we know the Rezound, Galaxy Nexus and this device are all on the way. There hasn’t been a better time than now to be a Big Red customer. Oh, and we are hearing from readers that some stores may even have demo units out for you to play with. If this phone is tempting you (and it probably should at least a little), you may want to cruise into a store tonight or in the morning to get some hands-on time with it. To see what you are missing, check out our time with the device from a few weeks ago here (photo gallery here). Verizon to Run "Double Data" Promo During November? 4GB of Data For Just $30?